Directed by Oscar nominee Judith Ehrlich, The Boys Who Said NO!, is an independently-produced documentary in the making, co-sponsored by The Resource Center for Nonviolence. BOYS! 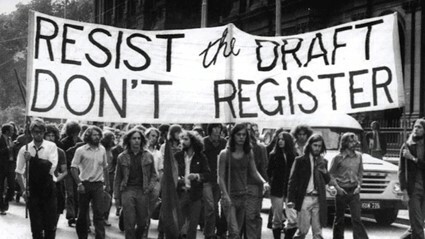 focuses on hundreds of youth who called themselves The Resistance who were part of individual and collective acts of nonviolent noncooperation with the draft, risking arrest and imprisonment for up to 5 years, becoming a critical part of the anti-war movement and the eventual end of the draft and the Vietnam War. The Boys Who Said NO! features original interviews with more than thirty male and female nonviolent activists and historians, such as Joan Baez, legendary folksinger, long-time nonviolent activist, and friend of the RCNV, David Harris, cofounder of The Resistance, and many more. The film explores the Selective Service System, the federal justice system, and the prosecution and trials of war resisters, showing news footage of anti-war demonstrations and The Resistance’s rising visibility, anti-draft meetings, and smuggled film of resisters serving time in Federal prison as well as the influence of Gandhian nonviolence and the Civil Rights Movement on The Resistance. The Boys Who Said NO! is still looking for YOUR support to reach their goal of finishing the film in 2018; you can help by donating or coming out to their upcoming sneak previews and sharing them throughout your community!